Managing turf disease can seem like an endless battle for many greenkeepers, but it doesn’t have to be that way. In Performance Bowling Greens and on this blog for over 7 years now you might have noticed that there’s been a bit of an obsession with soil health. Over many articles I’ve described the folly of expecting better results but still doing the same old maintenance on bowling greens. It’s important to find ways to reduce the input of inorganic fertilisers and pesticides in order to create and maintain a healthy rootzone in your green. And this isn’t just namby pamby tree hugging speak. The quickest, most economical, least stressful and most importantly, permanent way to create a high performance bowling green, or golf green, or tennis court, or cricket, football, rugby, polo pitch (i.e. anywhere you want a high performance sports turf surface dominated by the fine perennial grasses), is to focus on the health of the soil and plants. Even in the very early stages of adopting the Performance Greens Program (my personal take on achieving the above) greenkeepers notice a reduction in the incidence of turf diseases, allowing them to significantly reduce and in many cases stop fungicide applications. All because the soil is being allowed to recover its naturally healthy state. One aspect of turf management I’ve talked about a lot is that the excessive thatch build up commonly seen on sickly bowls greens is unknown in natural grasslands. Closely related to this is the almost complete absence in natural grasslands of serious fungal disease outbreaks. The reason for this is that the two (excessive thatch and fungal disease) are cause and effect; the excessive thatch creates the ideal environment for fungal pathogens i.e. a soft, wet and warm substrate populated by weak, sickly plants. Managing turf disease then, is actually just a matter of understanding this. The reason then, that we don’t see disease outbreaks on natural grasslands and/or healthy sportsturf surfaces, is that nature helps plants become disease resistant. And interestingly, we now have the ability to reintroduce and encourage the dominance of many of these natural defences that plants have against diseases in our rootzones. This isn’t a nice to have feature on your green. This is essential for the future of the game as it not only benefits the plants, but it helps to create the right conditions for high performance. And high performance greens beget high performance players. And the cost savings added to this make it essential to club health too. So what’s not to like about all of that? Why isn’t this the norm? The change isn’t instant and clubs are addicted to seeking instant results. Incidentally, although results aren’t instant, they are cumulative, and measurable improvements are experienced all along the way, which I suppose makes it instant-ish! Managing turf disease naturally doesn’t sell stuff quite so effectively or continually as a customer who is constantly lighting fires (applying salt laden, inorganic fertilisers) and then having to put them out again (with fungicide). Spongy, soft, thatchy, annual meadow grass turf also moves about continually. This causes a continuum of anomalies on the surface, which can be used to sell sand for top-dressing, which incidentally does nothing to improve the situation and actually adds to the tendency for the rootone to become inert and lifeless. In natural grasslands, the grass plants (remember they are incredible sugar factories) provide the food for the billions of beneficial microbes that live in every ounce of healthy soil. If plants actually suffer and die this food source is lost to the microbes. Nature, as we’ve seen in many articles, doesn’t need us to help it along, and over millions of years, the grass plants and microbes have evolved their own systems of co-existence and in the process have developed a range of defence mechanisms to make sure plants stay alive. So the easiest way for greenkeepers to manage turf well is to exploit these defence mechanisms. First we must ensure that the grass plants have strong cell walls that are resistant to invasion from fungal pathogens like fusarium. To do this we need to prevent too much lush growth by limiting Nitrogen application. We can also help this process by applying bio-stimulants which provide plants with many of the elements they need to naturally strengthen the cell walls. It will be no surprise to anyone familiar with the links land that fescue, with its hard, wiry stricture and similarly robust cell wall structure, is more resistant to disease than annual meadow grass (Poa annua), which is a softer, weaker grass generally, but has a particularly weak cell structure when compared to the hardy perennial grasses. This is down to a greater lignin content in the fescue cell structure, which makes it harder for pathogens to penetrate the cell walls and is more difficult to digest. 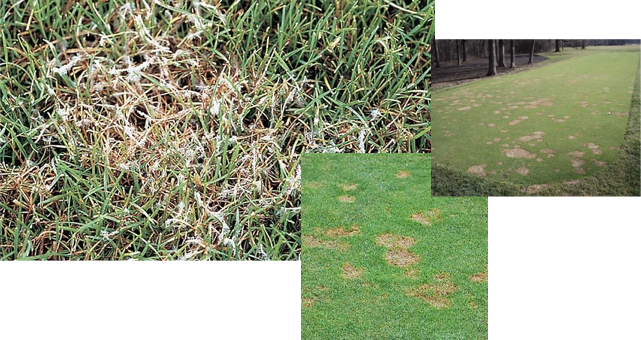 Given the choice the pathogen will move on to a softer target like Poa annua, which has more cellulose and high energy sugar in its structure. 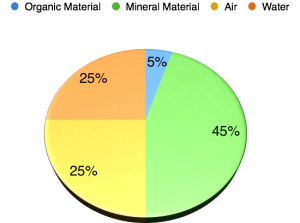 Knowing this gives you a great advantage in managing turf disease effectively. Fungal pathogens such as Fusarium typically invade plants by exploiting weaknesses, such as physical damage from dull mower blades, through pores or by deploying enzymes to break down the cell wall structure. We’ve seen that on natural grasslands like the links land, plants have coexisted and evolved with the diseases that attack them for millions of years. This evolutionary process has helped the plants to develop a range of defence mechanisms that come into play as soon as they come under attack. To counteract such an attack, the grass plant produces its own toxic chemicals and enzymes which fight back against the pathogen. Going a little deeper for a moment, this results in the production of hormones which act much like our own white blood cells do when our body is under attack from disease, injury or infection. These specialised defensive hormones pour into the part of the plant that is being subjected to attack and act as toxins which kill the invading pathogen. Managing turf disease is made simple if we can stimulate the grass to produce these immune responses by using bio-stimulants and keeping off the fungicides. Soil microbes abound naturally in healthy soil and we already know that the physical components of healthy soil are pretty close to the ideal shown on our by now famous pie chart on the left. However, already knowing something hasn’t stopped humans from continuing to do daft stuff since the beginning of time. Once you have a physical structure to your soil that is ideal, you can’t make it more ideal, there’s no such thing. The current obsession with sand top-dressing is partly driven by a sketchy understanding of construction specifications like the USGA specification for golf green construction. Despite its critics the USGA specification actually provides a very useful set of guidelines for creating a high performance surface. That’s not to say that it is simple to understand and in fact it includes quite a complex set of instructions for creating rootzones that drain quickly, yet retain sufficient moisture and nutrition to sustain a healthy sward of turf grass. To achieve this it utilises a significant proportion of sand in the mineral component and this is where the trouble starts. I still hear the term “Sand Green” batted around every week of the year. They are not sand greens, the rootzone element of them is termed Sandy Loam, which describes a very specific range of soils by soil texture. Golf and Bowls greens all over the world, but in particular in the UK have had their maintenance regimes adapted in mis-guided attempts to turn them into USGA type greens with disastrous effect. Greens that are overly sandy and that continue to be subjected to more of the same are having turf disease outbreaks built in as an inherent part of their make up. They need much more fertiliser to keep them growing, higher water inputs via irrigation and inevitably this leads to thatch build up and routine fungicide use which kills off beneficial fungi. The cost of continuing on this path in money terms is of course significant, but that pales when compared to the cost to the long term health of greens and clubs. The plants can look after themselves if we just give them the chance to do so. As Greenkeepers we’ve been taught to be suspicious of fungi. The only ones we know of are usually the baddies like fusarium, take all patch and dollar spot. In a healthy green there are many thousands of other fungi species, not to mention the thousands of bacterial species that work symbiotically with our grass plants all year round. These microbes need our grass plants to stay alive as much as the plants need them. Soil microbes need the host plant for food and survival, so they have evolved mechanisms to ensure their host plant stays alive. When a plant comes under attack, it sends out signals to the soil microbes which respond by defending the plant from pathogens. On bowling greens that have been through many cycles of the Circle of Decline the problem that arises is that these defensive microbes are missing. Ironically, because we’ve inadvertently killed off beneficial microbes with acidic, anaerobic conditions and fungicides, the only recourse we have at this point is unfortunately the bottle (of fungicide). This is the Circle of Decline in full swing. We can start to counteract this any time we like. There’s no need to wait until spring or for any particular set of circumstances. We can start today to return our greens to rude health by finally admitting that we have a problem and vowing to stay off the bottle. We can stop using high salt index inorganic fertilisers in favour of microbe friendly organics, which allow the microbes to restart the humus building process in the soil by degrading thatch naturally. Reducing the use of inorganic fertilisers, increasing aeration and applying the correct bio-stimulants will encourage soil microbes to survive and thrive. We can add new microbes to ensure we have a full and growing compliment of these by using simple and inexpensive compost teas. Regular application of Compost Tea inoculates the rootzone with all of the bacteria, fungi, protozoa and beneficial nematodes it needs and natural bio-stimulants like liquid seaweed help to feed and nourish these, helping the populations to grow rapidly. It’s cheap and it works. Soil microbes employ a variety of key methods to protect our grass plants from pathogens in the soil. When a grass plant is attacked by a fungal pathogen it sends out a chemical signal to the surrounding soil microbes, some of which will respond by producing toxins with which to counter attack the pathogen. These work by interrupting the pathogen’s energy supply and are a bit like free natural fungicides, only very targeted and safe to the other soil fungi. They also act immediately, long before there are outward signs of a problem on the turf surface. This isn’t how ecology works and in fact, and perhaps surprisingly, many of the plant pathogenic fungi exist in beneficial form in the soil until plants show signs of stress or become weak due to weather, over fertilisation or lose their defence mechanisms for one reason or another. It would be a strange eco-system that nurtured a species whose sole job was to kill plants for the sake of it. Incidentally if you’re partial to a vegetarian sausage, you might be surprised to know that you’ve probably eaten a species of Fusarium, so it can’t all be bad…can it? It seems then, that potentially pathogenic fungi are opportunists and will turn pathogenic to our plants only when the protective mechanisms supported by beneficial microbes fall down and there’s suddenly a cheap meal available. If you have enough of the good microbes, they will starve the pathogens of food, preventing them from growing, multiplying and continuing the attack so that it never reaches the stage where you’d notice it on the turf surface. This is why it is so important to degrade thatch and convert it to humus by colonising the thatch layer with good fungi and bacteria, because excessive thatch provides the perfect micro-climate and feeding ground for pathogenic fungi like fusarium. Beneficial fungi and bacteria in the soil form barriers to entry for pathogens. 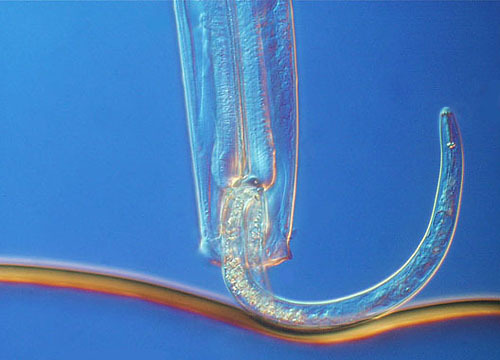 The mycorrhizal fungi we discussed before, form a sheath of mycelia around the roots of grass plants. This creates a physical barrier, stopping any pathogen from getting close to the roots and thereby stopping them from penetrating the plant cells. As pay back for this service the mycorrhizal fungi get access to the constant supply of carbs and protein leaking from the roots. These root exudates are the main source of food for soil bacteria, which convert the protein into plant available nutrients. Low levels of beneficial bacteria and fungi in soil make it easier for pathogens to reach and attack the plant. In addition to forming a barrier around the plant root system, when present in sufficient numbers these microbes convert root exudates to plant ready nutrients, making it possible for us to reduce fertiliser inputs. In a teaspoonful of healthy soil there can be a billion microbes and as you might imagine, they like to eat each other. Making sure therefore, that you have a predominance of beneficial bacteria, fungi and predatory nematodes means that harmful fungi and root feeding nematodes will be eaten long before they become a problem. We know that natural grasslands are naturally, relatively disease free. 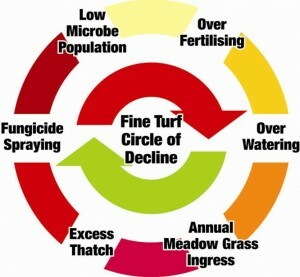 This is also true of some bowling greens, but I think the vast majority of greens are at some stage of the Circle of Decline which means a continuous cycle of fertiliser – water – disease – fungicide – fertiliser and the object for many greenkeepers must be to break out of that cycle. But, how can we re-introduce and then encourage the continuation of these natural defence systems over the long term? Greens where the Sand Man has visited year after year are usually very low in organic matter and simply can’t support a diverse microbial population. This means we need to add microbes to replace extinctions and shortages. Into the bargain these new microbes must be fed with bio-stimulants to keep them alive. Thatch is the natural food source for both beneficial and pathogenic fungi, so we need to make natural thatch degradation the top priority. This process converts organic material (thatch) to organic matter (humus). The rebuilding of humus is what turns an inert, overly sandy rootzone back into a healthy and lively soil where grass plants can largely take care of themselves. Humus is stuffed full of compounds like the humic and fulvic acids we discussed before that are key components in making rootzones ideal environments for the finer perennial fescue and bent grasses. As people of the soil, we instinctively know when soil is healthy by its look, feel, smell and taste (kidding about the taste, just checking you’re still with me) and it is humus that is largely responsible for this. Can you honestly say you get that healthy soil feeling that when you take a sample out of your greens? None of the above criticism of overly sandy rootzones is necessarily aimed at USGA specification greens. Well specified and correctly built & maintained USGA greens are perfectly set up to provide exactly the kind of environment needed to grow a dense sward of fine perennial grass. They can be built with real soil to ameliorate the sand component and we can start on day one with the perfect physical structure, ready to be managed in a manner that encourages the perennial grasses we are aiming for. There are a lot of ifs and buts in there though, and sadly, hugely expensive USGA constructions are subject to all of the same mis-management as traditionally built greens. The main thing to remember here is that the degradation of thatch removes the food source for surface living pathogens and creates a humus rich rootzone to support a diverse microbial population that will form a barrier around the root system of perennial plants, much to our benefit. Managing turf disease is really very basic and simple. We are simply facilitating the recovery of the soil beneath our feet to a state that it would actually revert to naturally over time if we did nothing. The only difference is that we have a job to keep, so we must provide a high performance sports surface while we do that. Specific bacteria and fungi, such as mycorrhizal fungi can be applied in liquid or granular form by themselves or combined with fertilisers, seed coats or bio-stimulants. However, by far the simplest way to get started on this vital work is to start brewing and applying Compost Tea. This is a low cost way to ensure you are applying the widest variety of microbes which you grow yourself in a simple brewer at your own green. You can then tank mix this brew with any number of natural bio-stimulants, such as liquid seaweed and organic fertilisers, minimising the time you need to spend actually applying sprays to the green. As part of the Performance Greens Program this is the way to get your green’s soil started on the road back to health. Once that’s started, you can be sure that your soil will be increasingly attractive to the fine perennial grasses and once you do that you will be well prepared for creating a high performance green surface that provides your club with the greatest of assets. If you have any questions or comments on managing turf disease please use the comments section below or drop me a line directly. CAN I MAKE UP MY OWN COMPOST TEA BY USING ORGANIC GROW BAGS ? The compost and nutrients/additives supplied with the kit is pre-inoculated with all of the fungi and bacteria groups required for a diverse and complete soil micro-life that is optimised for fine turf (fescue/bent grass). There’s no telling what you’ll get with your grow bags and there’s no need to do this to cut costs either. Using the correct materials works out around £7 per application at most. It can actually be a lot cheaper if you buy bigger quantities of the ingredients. Although this is a new offer on Bowls Central, you can see what compost tea users are saying at the bottom of the Compost Tea Kit page in the reviews. If you have any other questions please feel free to drop me a line on email. Using Compost Tea as part of the Performance Greens Program will undoubtedly reduce your spend on fertilisers and certainly on fungicide. It’s not a direct replacement for either of these of course, but along with bio-stimulants and bio-liquid fertilisers and the physical work recommended in Performance Bowling Greens it will increasingly help to release the natural nutrition in the detritus discarded by the grass plants themselves as it is turned into rich, nutrient retaining humus. I’ll send you an email after I’ve had another look at your soil tests from May 2015. Are these the latest you have? Meantime, you might be interested in what a couple of tea brewers have to say over on the reviews section at the bottom of the Compost Tea Starter Kit page. I see them as doing two different and equally important jobs. However, the object of my performance greens program is to get to a place where they aren’t needed so much. During the renovation phase of Poa dominated, thatchy, heavily over-sanded and compacted greens I recommend rapid physical reduction of excessive thatch…usually an autumn program here. For this I use 5/8″ hollow tines, followed immediately by heavy scarification using something like the Graden GS04. The combination of these two removes around 20% of the green surface and with the addition of compost tea and bio-stimulants kick starts a rapid “thatch eating” response. Mini-solid tining is a useful operation for keeping the surface open with minimal disruption during the playing season and helpful for getting products into the greens such as wetting agent, compost tea etc. I don’t use normal solid tining so much, but recommend regular deep (5-6″) slit tining from October to March here on golf and bowling greens. The cumulative effect in compaction is impressive. Eventually though, the idea is to reduce disturbance by getting to a point where the Physical, Chemical and Biological state of the rootzone/green eco-system doesn’t need so many physical interventions. 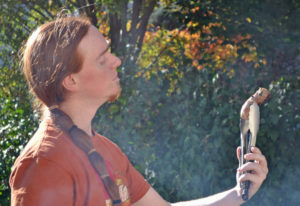 I have been applying Tea Brew Compost for nearly two season, along with the performance Bowling Green programme. This year I finally got rid of the patches of Poa Annua I had but, I have found there has been an increase in the worm population leaving unsightly casts on the green especially around the edges. Is this due to the increase in bacteria in the soil (which the worms also use ) ?. Is there anything I can do, or should I not stress over it. I don’t think it will be due to any increase in bacteria, but worms do thrive in healthy soil of course. Of the 50 species of earthworm we have, all of them are very important to soil health, but only 3 of them create surface casts. This is because they are surface feeders, pulling down plant debris from the surface and then depositing their waste on the surface. Keeping the surface clear of debris as much as you can will help. A mix of Chelated Liquid Iron, Liquid Copper and Salicylic Acid has been shown to be effective for worm cast suppression. This will also have an effect on moss. Wetting agents can also be effective. I explained my thinking on this approach in a recent article and readers have reported success with it, but I wouldn’t necessarily recommend trying it at bowling green scale with washing up liquid. It would be better to do a standard application of wetting agent such as Hydroaid, with perhaps a little more water than usual. Try it on the worst affected areas first.